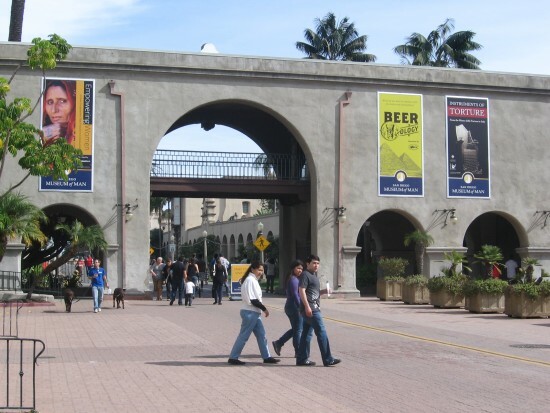 museums – Page 23 – Cool San Diego Sights! 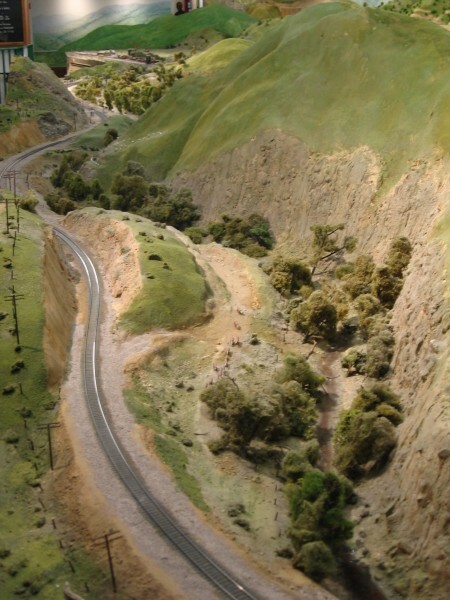 HO Scale model train travels through Tehachapi Pass exhibit. 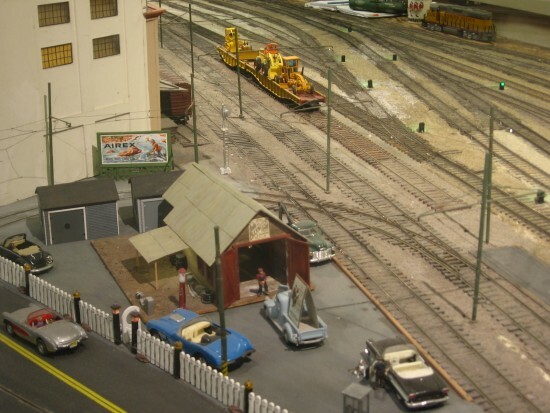 I could happily spend many hours at the San Diego Model Railroad Museum. 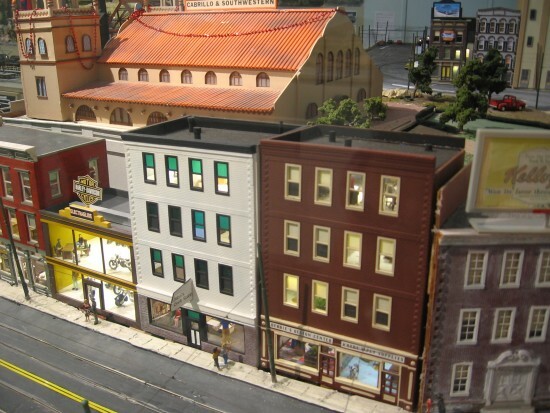 Not only is it the largest such museum in North America, but it features some of the coolest, most realistic model train layouts you’ll ever see! 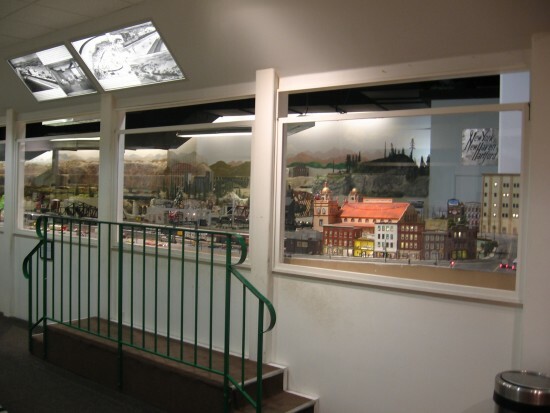 Located in Balboa Park, the model train museum contains five huge sections. 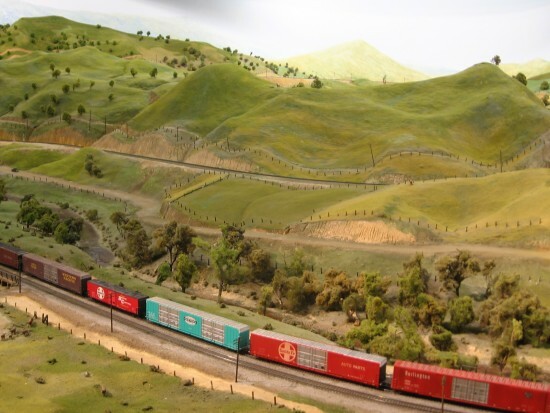 The Cabrillo Southwestern exhibit is in O Scale, the same size as Lionel toy trains. 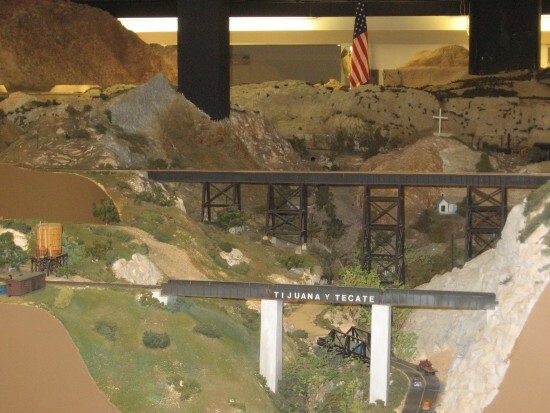 The San Diego and Arizona Eastern, and the Southwestern Pacific-Santa Fe Tehachapi Pass exhibits are both in the popular HO Scale. The Pacific Desert Lines exhibit is in tiny N Scale. 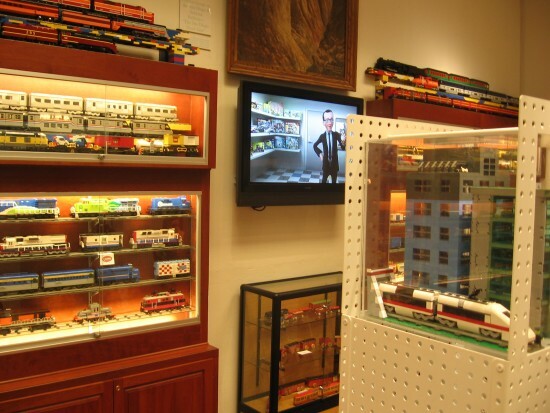 Finally, there’s a toy train gallery crammed with Lionel-type trains and many amazing moving accessories, including cars and people. 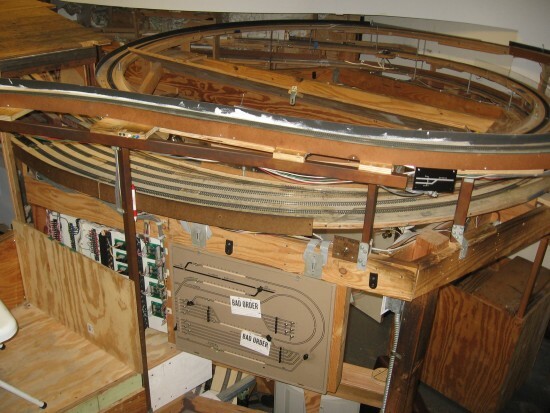 One train is mounted with a Choo-Choo cam which provides an engineer’s moving view of the dazzling layout. I took lots of pics yesterday afternoon. Many of the shots taken through glass or in darkness didn’t come out so great. But I did get some fairly good ones. Enjoy! 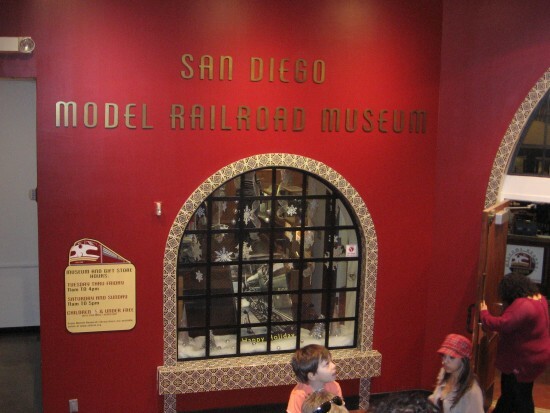 Kids love the San Diego Model Railroad Museum. Windows to the big Cabrillo Southwestern O Scale exhibit. 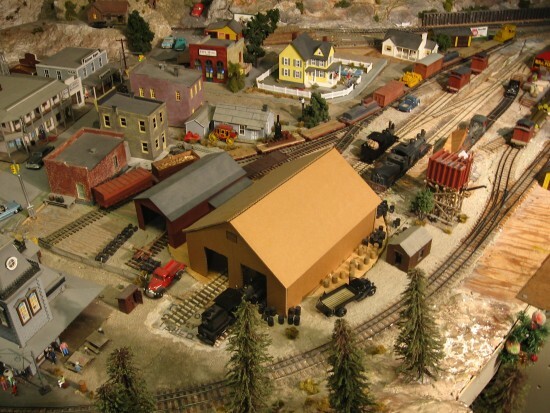 Large O Scale model train exhibit includes many detailed buildings. Rail yard action at the Cabrillo Southwestern exhibit. Tiny human figures at work near some trolley tracks. The elaborate O Scale exhibit is full of train action! Men work on unfinished San Diego and Arizona Eastern exhibit. HO Scale bridges and a detailed mountain scene. 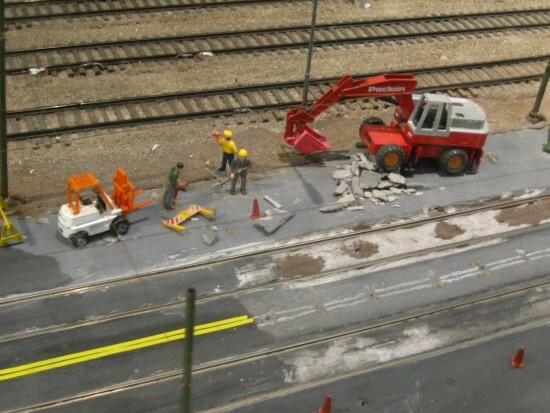 Attention to detail makes these model train exhibits lifelike. Tracks under construction climb to Tehachapi Pass Mezzanine. Pacific Beach Club Room with trains, videos and Lego exhibits. 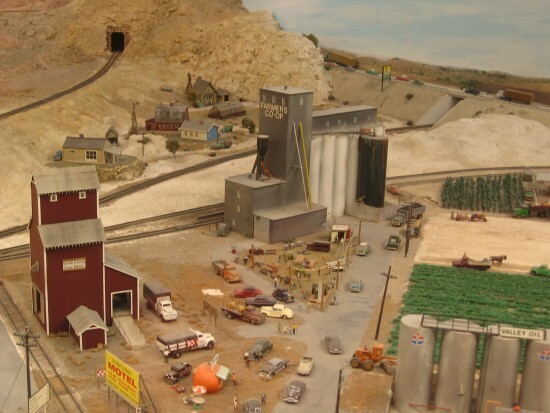 The famous Tehachapi Pass HO Scale exhibit is amazing. 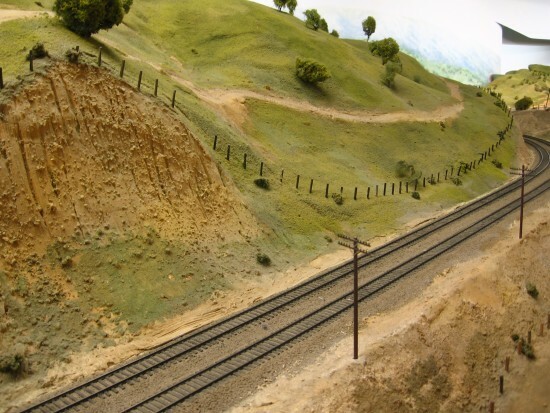 Train tracks meander through highly realistic hillside scenes. 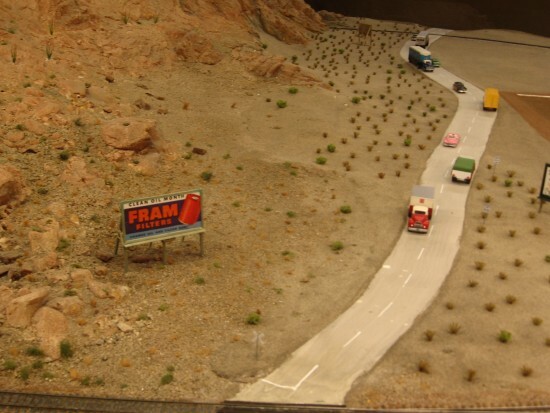 A stretch of desert highway in HO Scale. Model of a desert town at San Diego Model Railroad Museum. These huge train exhibits are a child’s fantasy come to life! 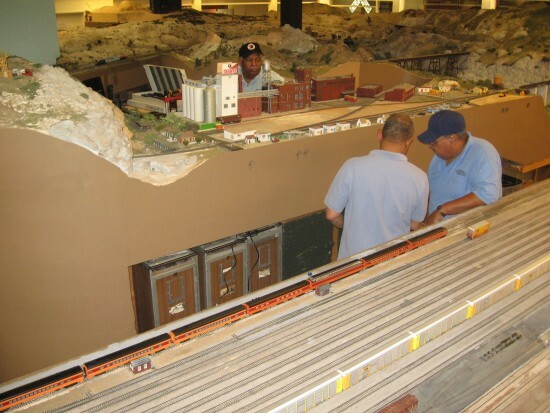 Member of Model Railroad Museum attends to derailed train. Almost every day this blog post is receiving visitors from Pinterest. I decided to visit the museum again in May 2017 to get more photos! The layouts are so huge and detailed it would take some time to describe exactly what the photos depict and from what position they were taken. So I’m just going to insert a bunch of random photos for you all to enjoy. Feel free to share any of these photos if you’d like. It’s all for fun! 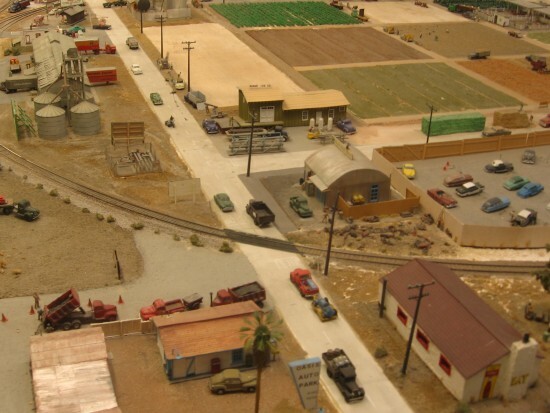 And if you ever have a chance, make sure to visit the San Diego Model Railroad Museum in Balboa Park. The place is truly incredible! Are you a railroad or streetcar enthusiast? Do you love railway history? You might like to check out my cool photos of the National City Depot museum and streetcars! 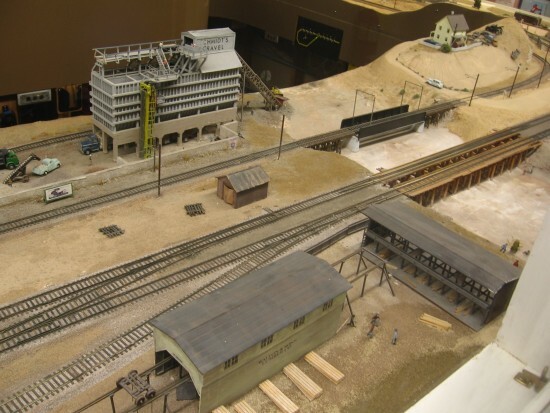 Posted on January 6, 2014 May 6, 2017 Tags balboa park, cool, fun, hobbies, kids, model trains, museums, san diego, trains, transportation10 Comments on Biggest model train museum in North America! 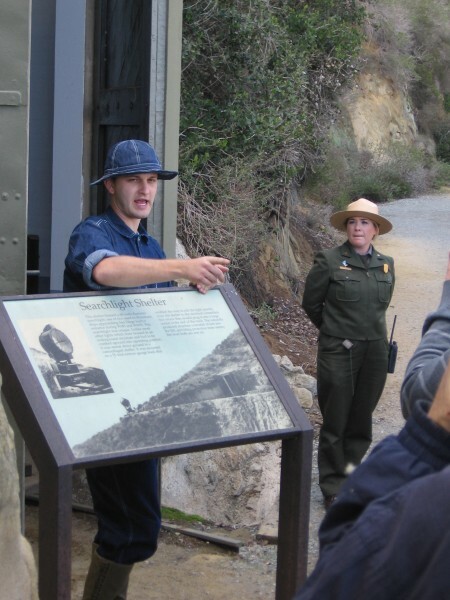 Cabrillo National Monument centennial photos! 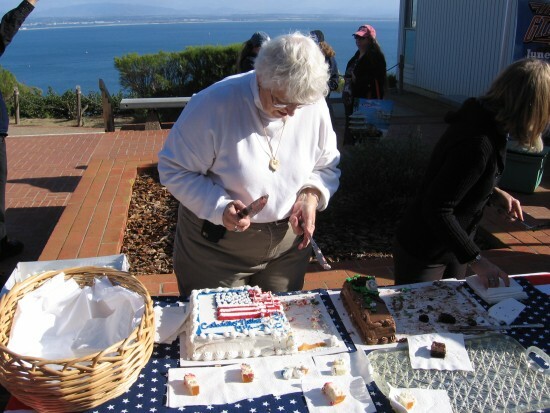 People near Visitor Center enjoy Cabrillo National Monument’s centennial. Here are some pics I took Sunday during the second day of Cabrillo National Monument’s centennial celebration. 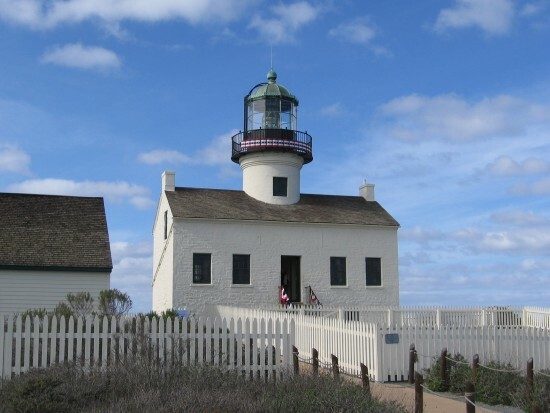 Cabrillo National Monument is located at the tip of the Point Loma peninsula. 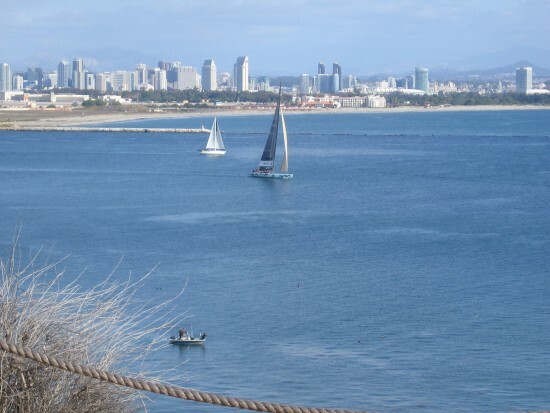 The hilly peninsula helps to enclose San Diego Bay and is a perfect lookout over both the ocean and harbor. 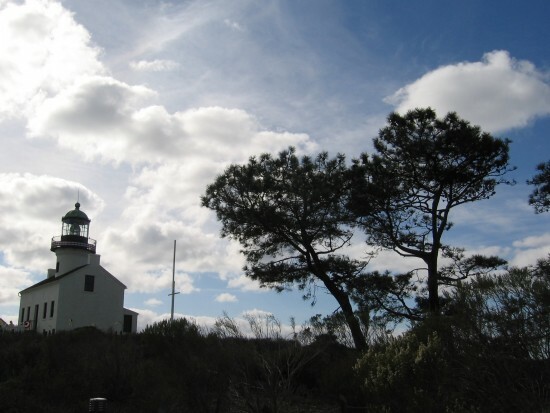 The park includes most notably the historic Old Point Loma Lighthouse and a statue of Juan Rodriguez Cabrillo that was commissioned by the Portuguese government in 1939. 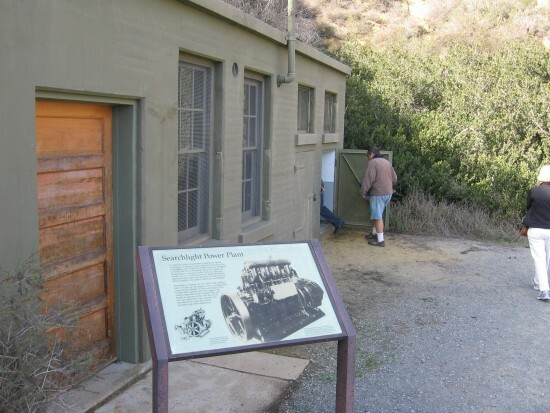 It also includes military bunkers that were used to protect the bay during World War II, and a very popular whale-watching lookout. The park this year turned one hundred years old. In 1913 Woodrow Wilson reserved a portion of Fort Rosecrans on the Point Loma peninsula for a statue of Cabrillo. Unfortunately, a statue was not immediately forthcoming, and the park’s development became the work of many decades. The work in progress continues today. My last visit was a few years ago, and this time I noticed many big changes and improvements! 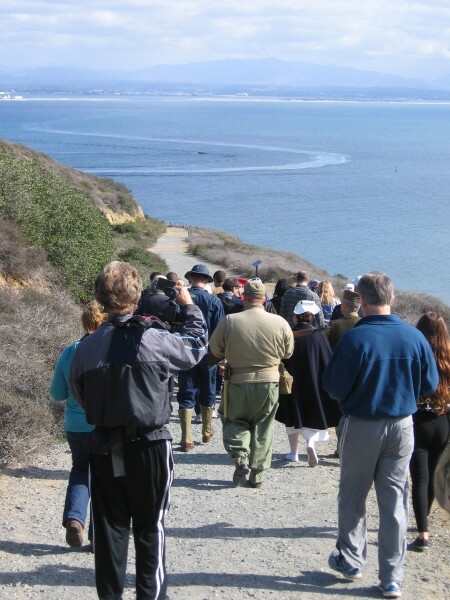 The first photo shows a bunch of people near the Visitor Center, on the walkway that leads out to the Cabrillo statue. Various informative displays in front of Visitor Center for the centennial event. For the centennial event, many community and government organizations had exhibits near the entrance to the Visitor Center. This pic shows what appeared to be the most popular table. 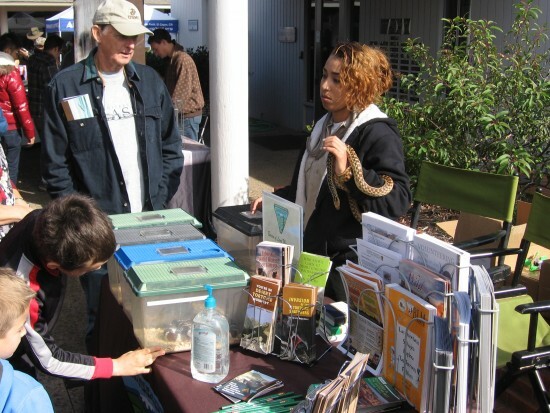 The friendly lady had numerous snakes that fascinated young and old alike. Yummy centennial cake was served to all park visitors. Everybody enjoyed a small slice of birthday cake! 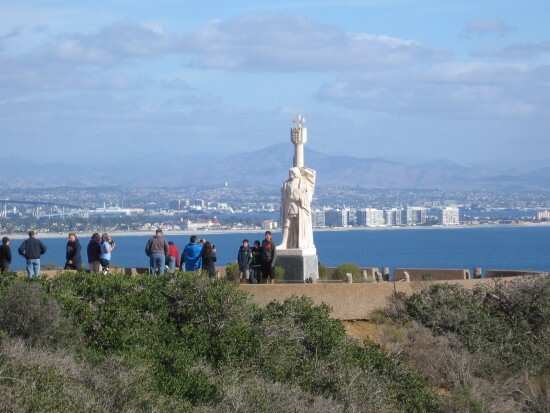 Statue of Juan Rodriguez Cabrillo overlooks the ocean. 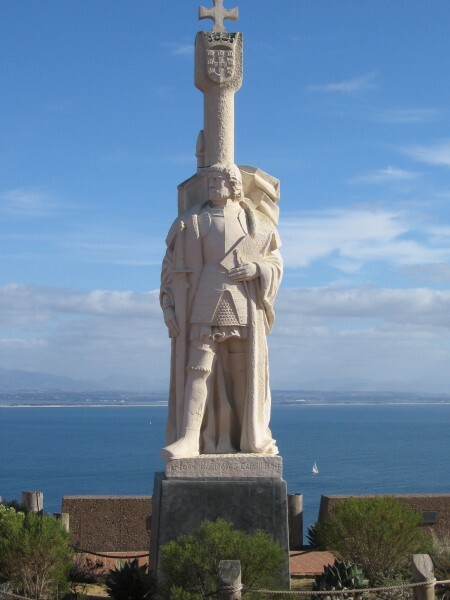 Here’s the iconic statue of Juan Rodriguez Cabrillo, the Portuguese explorer who sailed into San Diego Bay on behalf of Spain nearly five hundred years ago. 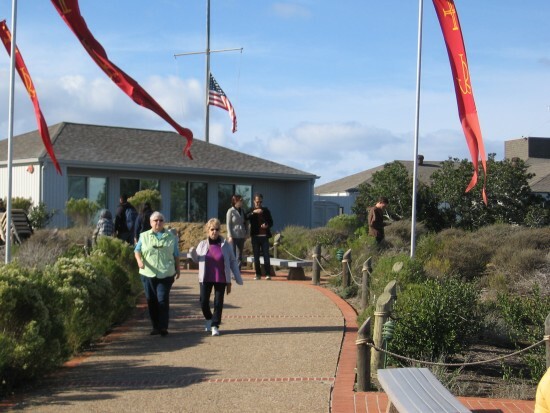 It stands not far from the Visitor Center overlooking both the bay and Pacific Ocean. 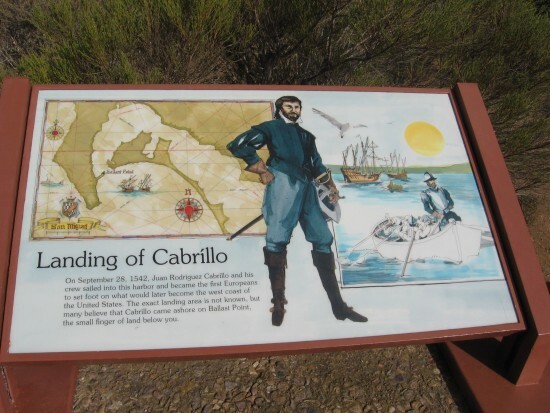 Park sign shows where Cabrillo entered San Diego Bay in 1542. Distant view of Cabrillo statue and Coronado Island. As I walked up the hill to observe a reenacted air raid drill from World War II, I looked back at this beautiful view. 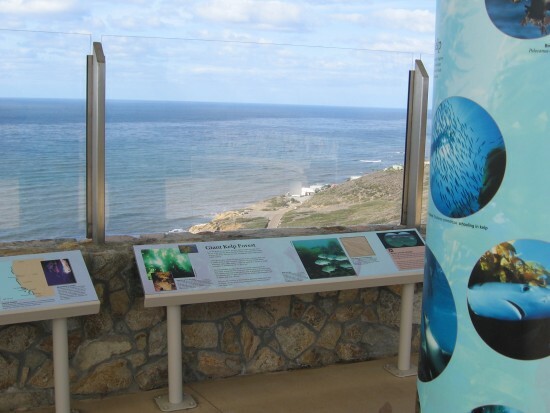 Great views can be had at Cabrillo National Monument looking in almost any direction! 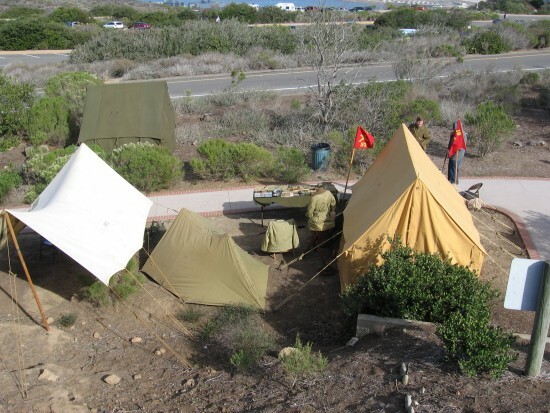 Tents of Army camp set up as historical reenactment. These tents and some nearby vehicles were on display for the centennial. During World War II, after the Japanese attacked Pearl Harbor, many feared an attack on San Diego. So defenses were quickly erected. 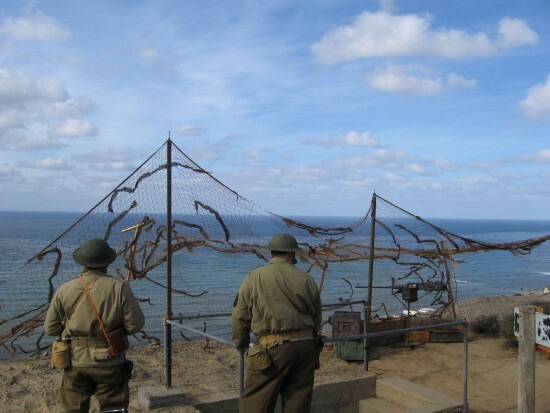 In addition to a number of observation bunkers, a few gun emplacements were situated along the end of Point Loma to defend the mainland and bay. 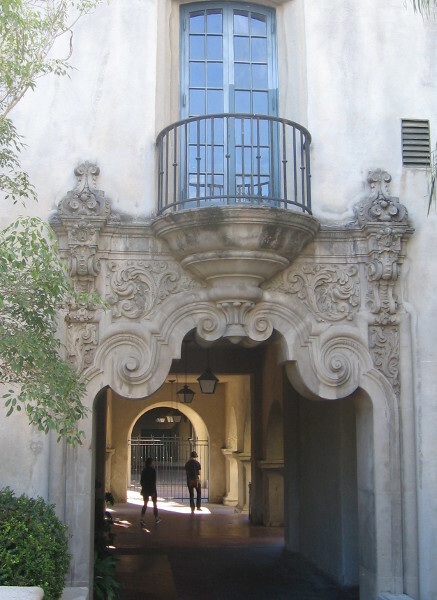 A small museum nearby includes many photographs, recordings and artifacts from that period in San Diego’s history. 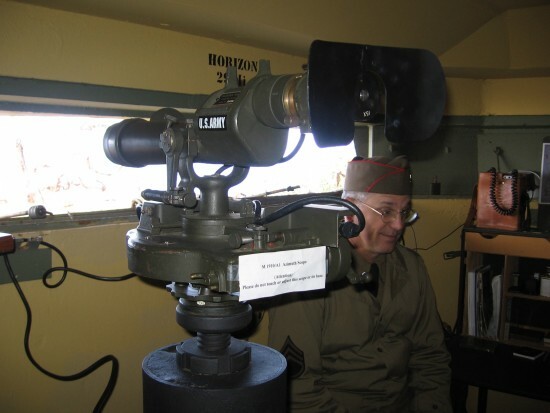 Mock air raid drill recalls duties during World War II. At eleven o’clock, a mock air raid was staged! An aircraft from nearby Naval Air Station North Island swept over the bluffs as World War II veterans and enthusiasts looked on from the hilltop near some old bunkers. 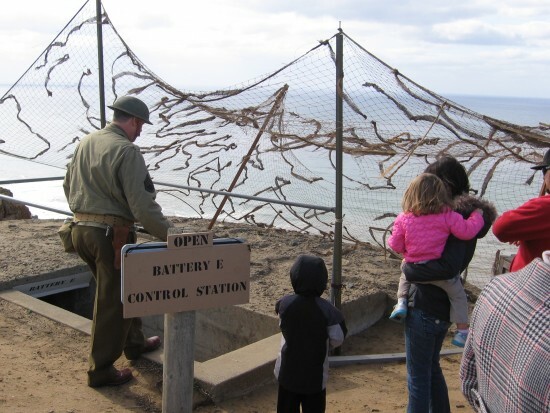 Visitors head into Battery E bunker used during World War II. After the air raid, we all took turns going down into Battery E.
A look inside Battery E and equipment to sight enemy ships. We were surprised at what we found! The flash of my camera illuminated the small semi-dark bunker, capturing this instrument used to scan the horizon for Japanese warships during World War II. 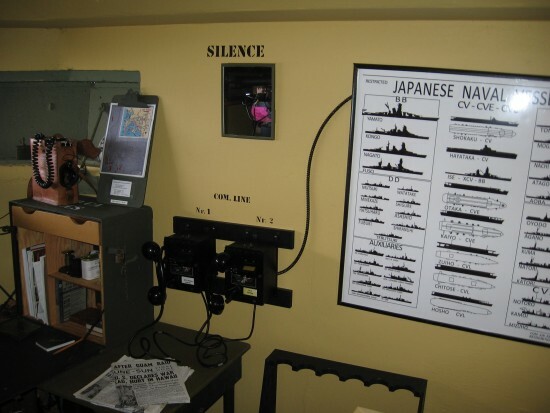 A chart inside the bunker identifies Japanese warships. Down a nearby ladder was a second small room containing beds for those who stood watch at all hours. People walk toward the old Cabrillo lighthouse. 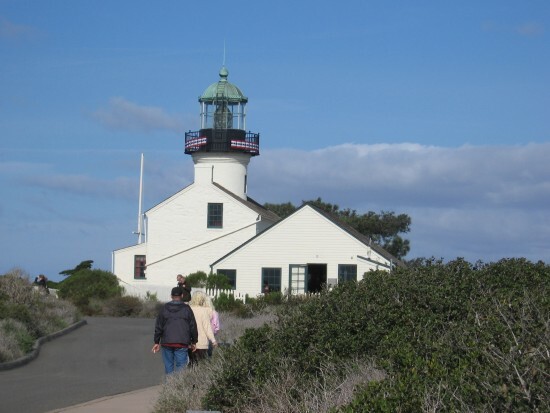 A short distance from Battery E is the historic Old Point Loma Lighthouse. From 1855 to 1891 it stood as a beacon for those entering San Diego Bay, before being replaced by an automated lighthouse down near the water. This old lighthouse is one of San Diego’s most well-known sights! 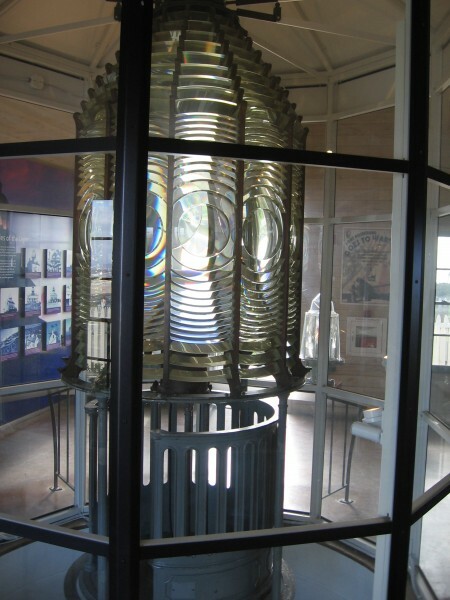 A museum by the old lighthouse includes the first Fresnel lens to be used by the automated New Point Loma Lighthouse. A small museum near the lighthouse’s entrance is worth a quick look. 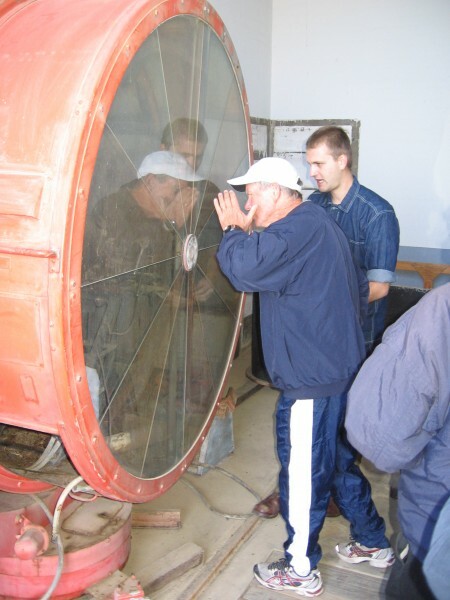 It includes an amazing Fresnel lens that magnified light to help sailors out at sea. Front of the historic lighthouse and its large rainwater basin. A large flat area in front of the lighthouse was used by the keeper and his family to capture rainwater. Back then this lighthouse stood isolated, far from the small town across the water that grew into metropolitan San Diego. 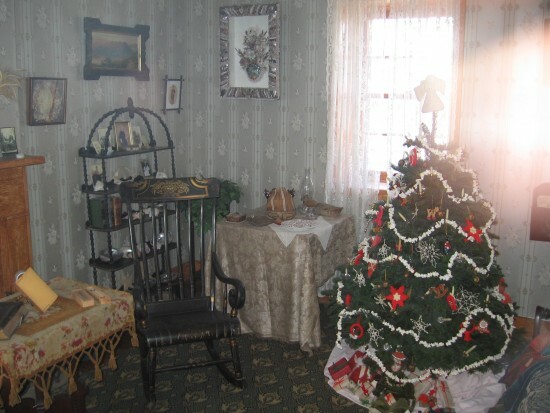 Recreated family room in Cabrillo lighthouse includes Christmas tree. Several furnished rooms in the lighthouse are on display behind glass. Very little space was available to accommodate the keeper and his family. In addition to this main room, there’s a kitchen area, closet, and two bedrooms up the winding stairs. 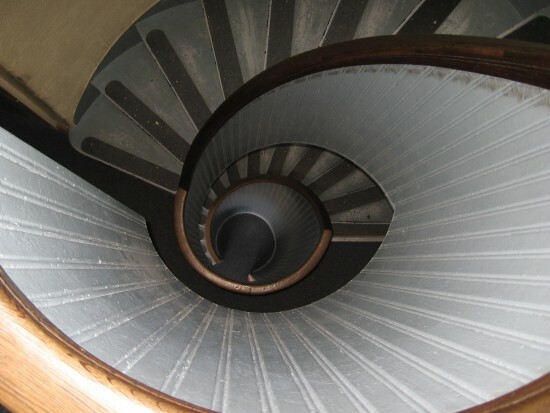 Looking down winding stairs from top of Cabrillo lighthouse. Speaking of the stairs, I couldn’t resist taking this pic! 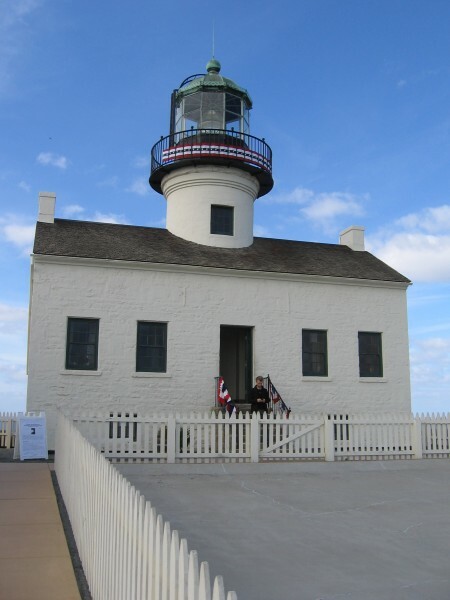 Another view of Point Loma’s historic old lighthouse. 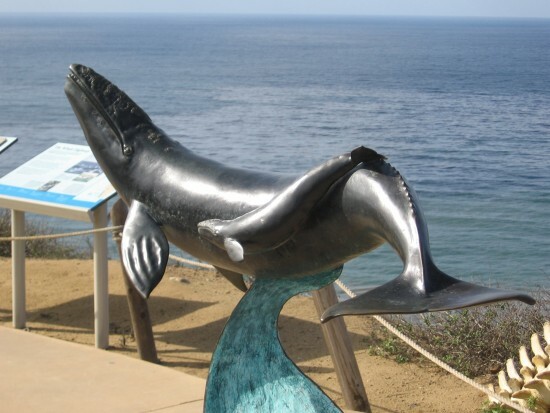 Grey whale sculpture near Pacific Ocean overlook. Interesting sculptures, artwork and signs can be found at the Pacific Ocean overlook. During the winter months, you can see gray whales spouting as they travel between the Arctic and Baja California. A good place to spot migrating gray whales during the winter months. You can see where the tidepools are below. I didn’t go down to the water on this trip, but it’s a fun place to see all sorts of sea creatures! Walking down to Bayside Trail and folks who will talk about history. At noon there was a guided hike down the Bayside Trail. 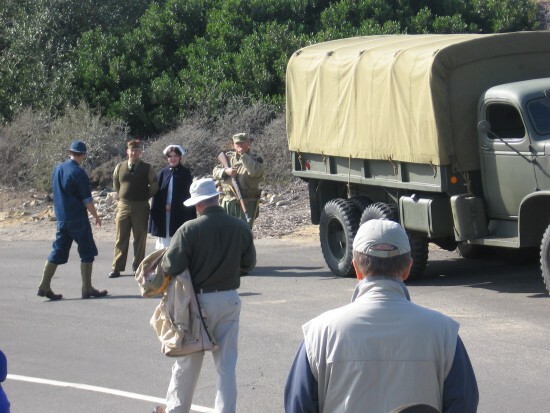 We walked down a short road to the trailhead, where an old military truck waited with some folks dressed in historic uniforms. They would show us some interesting stuff down the trail. 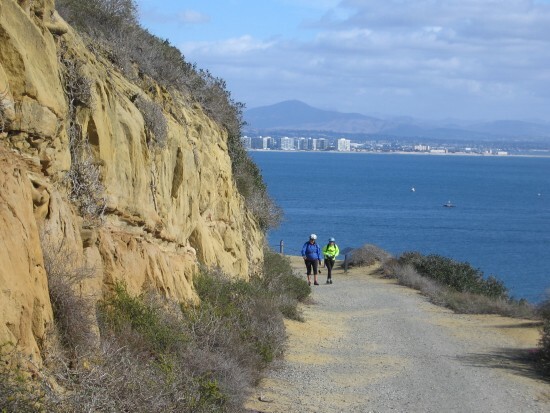 Group walks down Cabrillo Bayside Trail on a December day. Here we go down the Bayside Trail. The lady park ranger showed us a large number of native plants, including Coastal Sage, Lemonade Berry, Prickly Pear and more. The flora you see here is what is natural to the area. San Diego is located in a semi-arid zone, with very little precipitation. Most of the trees and other plants you see around town are not native. A spotlight protected San Diego Bay during World War II. We’ve come to a small structure built into the hillside that houses an old electric spotlight. The huge lamp was used to watch the San Diego Bay’s entrance during World War II. It rolled out on a pair of tracks and plugged into an outlet that you can see by the trail. Inside the small structure we look at the huge wartime spotlight. My camera’s flash brightly illuminated the old spotlight inside. Further down the trail is the spotlight’s generator building. Now we’ve walked down to the electrical generator building–really just two small empty rooms. Usually these structures are closed to the public. Rounding a corner of the sandstone cliff San Diego comes into view. America’s Cup boat Abracadabra sails down the San Diego channel. And I was rewarded with this view. Having lived in San Diego a good many years, I recognized the large sailboat leaving San Diego Bay. It’s the Abracadabra, a boat used in a past America’s Cup. I also spotted the Stars and Stripes, just out of this picture. Beyond downtown San Diego I could see numerous mountains, from Cuyamaca on down to Otay. When it snows in the mountains, San Diego has a snow-capped backdrop viewed from here! One last fond look at the beautiful Cabrillo National Monument lighthouse. Posted on December 8, 2013 July 8, 2017 Tags cabrillo, cabrillo national monument, events, history, lighthouses, museums, point loma, san diego, san diego bay, statues, walking, world war IILeave a comment on Cabrillo National Monument centennial photos! 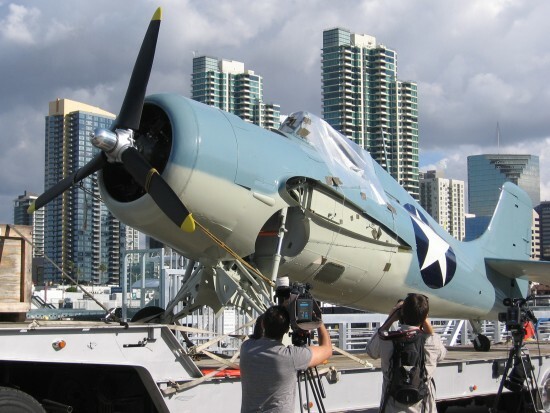 Restored Wildcat fighter lifted onto USS Midway. Wildcat fighter plane arrives at Navy Pier. Every so often a new plane is added to the Midway Museum collection. The historic aircraft carrier USS Midway, active from 1945 to 1992, now has a couple dozen restored airplanes among its exhibits. Today the latest addition was hoisted up onto the dockside elevator by crane from the pier below! I was there to snap a few cool pics! The last time I saw an airplane brought over from North Island, where the restorations take place, it was by barge. So I was surprised this time when a plane arrived on the back of a truck. This F4F Wildcat is a specimen of the small carrier-based fighter that helped to win the Battle of Midway during World War II. This particular plane was salvaged from the bottom of Lake Michigan. Restoration in a special hangar at Naval Air Station North Island, across San Diego Bay, took three years. You’ll notice the wings are missing from the fuselage. They came in on a second truck! The first photo shows the Wildcat arriving on the opposite side of Navy pier. 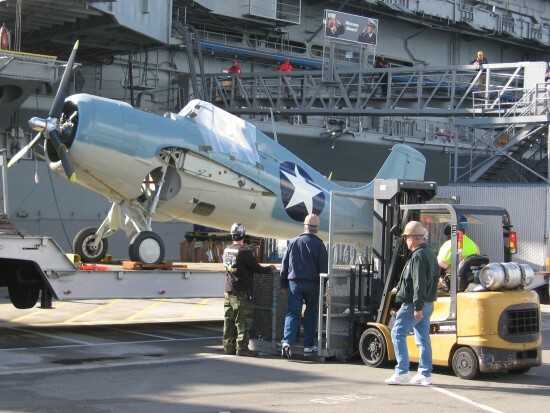 Historic airplane transported by truck to USS Midway. The truck has pulled alongside USS Midway’s dockside elevator, which is lowered and ready to receive the new exhibit. 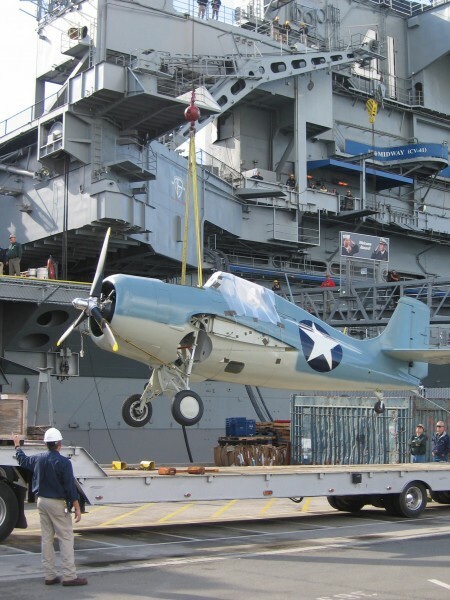 Preparing to lift Wildcat onto USS Midway’s elevator. A small crane waits off to the left to lift the airplane. Here we see some preliminary preparations. 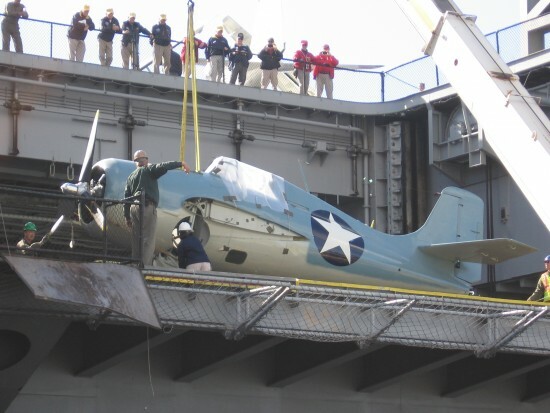 Crane begins to lift F4F Wildcat onto USS Midway. Up it goes! Everybody was extremely careful that no mishaps occurred! Aircraft is placed on USS Midway while people watch from flight deck. And finally the F4F Wildcat is aboard its new home! This plane will be part of a three dimensional theater exhibit called Battle of Midway Experience. I can’t wait to see it! 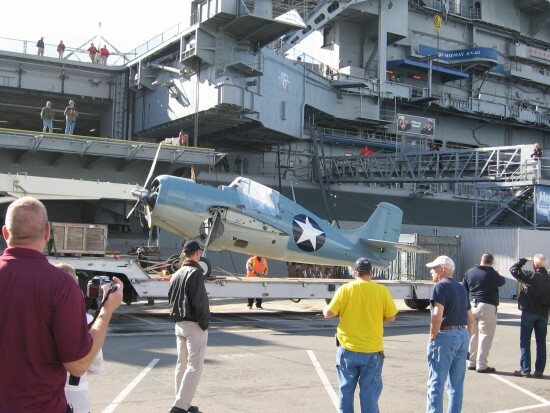 Posted on December 5, 2013 December 5, 2013 Tags aircraft carriers, airplanes, events, history, midway, museums, navy, san diego, san diego bay, world war II4 Comments on Restored Wildcat fighter lifted onto USS Midway. San Diego Museum of Art’s Sculpture Garden. 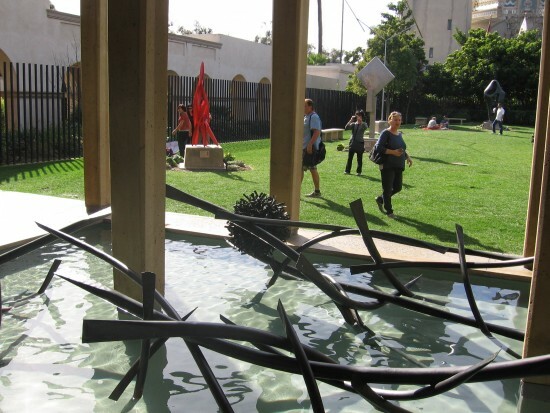 An opening in a fence near Balboa Park’s theatre complex leads back south into the San Diego Museum of Art’s grassy Sculpture Garden. Step through with me! 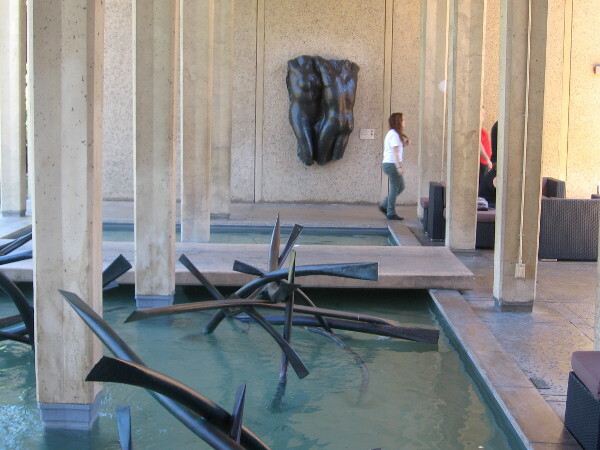 After slowly crossing the outdoor space, gazing at interesting, often organic abstract artwork, we pause in the shade of the Sculpture Court and turn back for a photo. Here it is! In the background, you can see the Museum of Man’s colorful dome and the California Tower. Behind us is an open air cafe. UPDATE! Here are more photos that I took during various future visits! California Tower high in the blue sky behind unusual, thought-provoking art. Aim I, Alexander Liberman, 1980. Biased sliced aluminum tubes. Cubi XV, David Smith, 1964-64. Stainless steel. Two Lines Oblique: San Diego, George Rickey, 1993. Stainless steel. 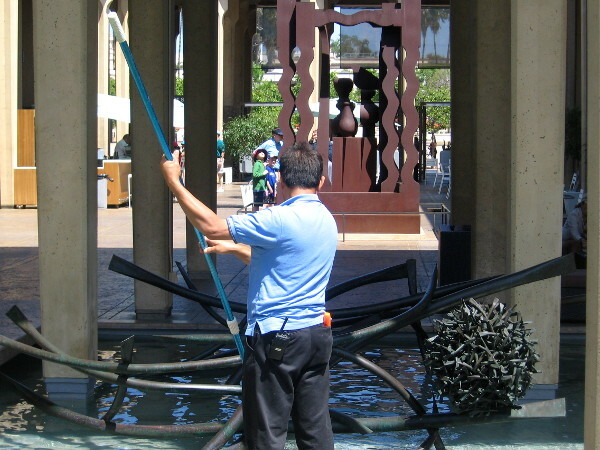 These interesting abstract sculptures are free to view in Balboa Park. Figure for Landscape, Barbara Hepworth, 1960. Bronze. 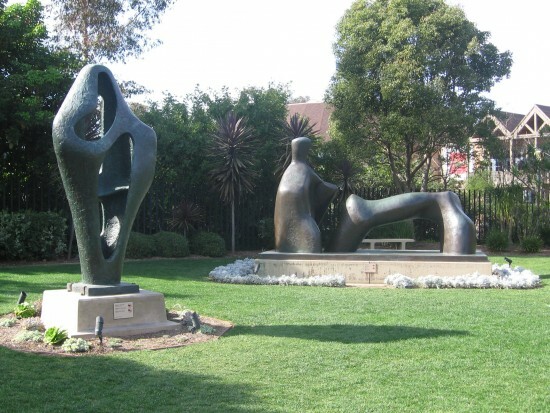 Reclining Figure: Arch Leg, Henry Moore, 1969. Bronze. Peeking through one sculpture back across the lawn. Another view of the Sculpture Garden on a day with lots of people about. 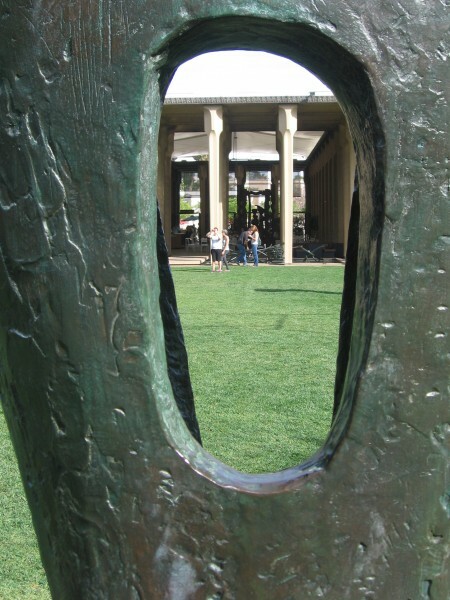 Turning to the north, we see more artwork in the Sculpture Court. Sonata Primitive, Saul L. Baizerman, 1940-48. Copper. 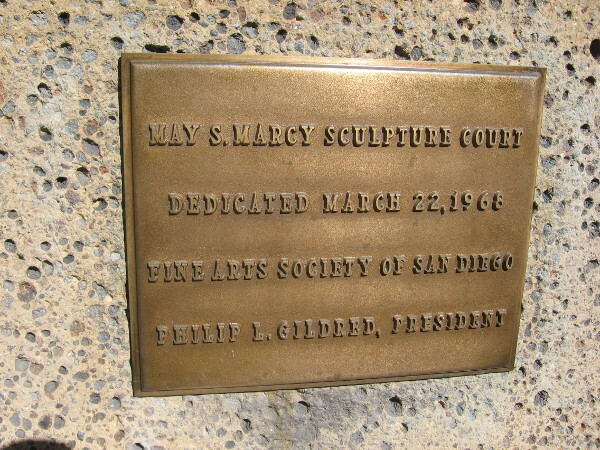 The May S. Marcy Sculpture Court was dedicated in 1968. Man cleans small pool containing fascinating art. This sculpture is titled Night Presence II, 1976, by artist Louise Nevelson. 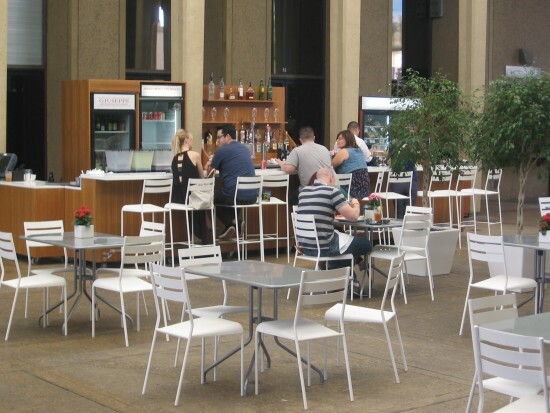 The cafe in San Diego Museum of Art’s unique Sculpture Court. 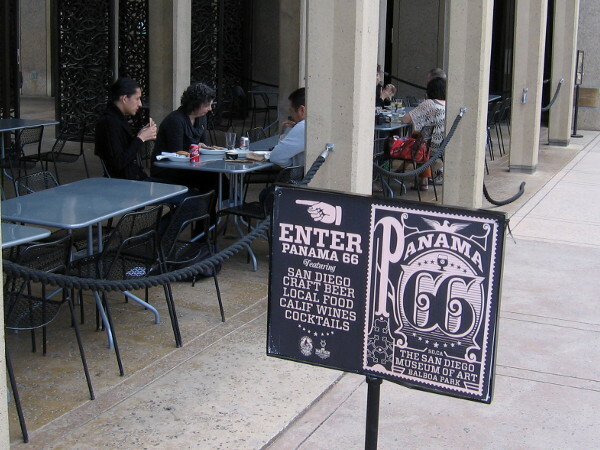 Sign directs people to Panama 66 in Balboa Park. 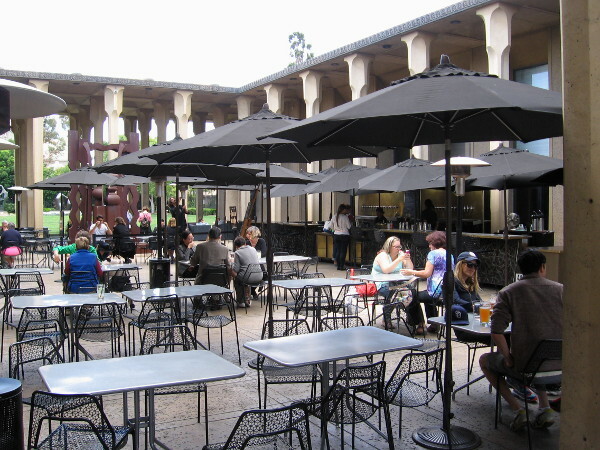 Diners enjoy Panama 66 food and refreshment in the Sculpture Court of the San Diego Museum of Art. Posted on October 24, 2013 July 30, 2017 Tags abstract art, art, balboa park, culture, fine art, museum of art, museums, photography, san diego, sculptureLeave a comment on San Diego Museum of Art’s Sculpture Garden. Pleasant stroll toward the Old Globe Theatre. Turning for a moment to the left, we see the east side of the Museum of Man’s colorful dome and the picturesque California Tower. A pleasant nook below with benches. That’s the Craig Noel Garden, named after the Old Globe Theatre’s founding director. This is a great place to take a rest, or read a book! 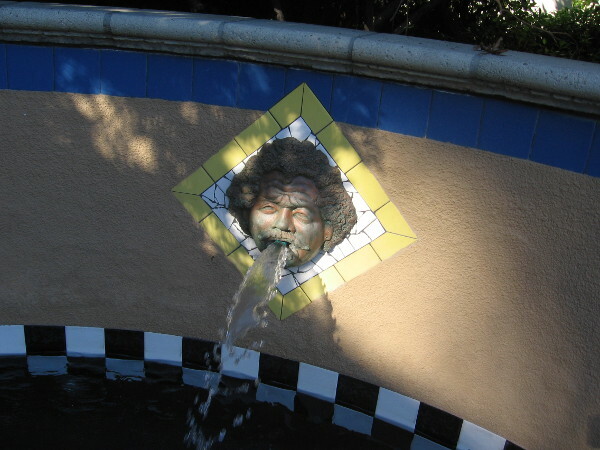 Water splashes from face in fountain at west end of the Craig Noel Garden. 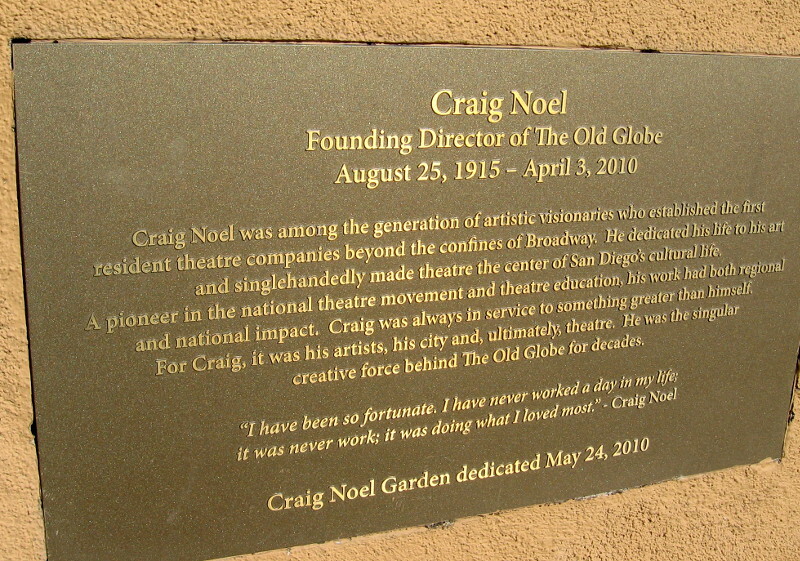 Plaque explains how Craig Noel helped to found the Old Globe Theatre. Passage by Museum of Man leads back toward El Prado. Posted on October 22, 2013 November 22, 2014 Tags architecture, balboa park, california tower, color, museum of man, museums, old globe theatre, san diego, theatre, walkingLeave a comment on Pleasant stroll toward the Old Globe Theatre. Beer, headhunters, and instruments of torture. Check out these two banners! 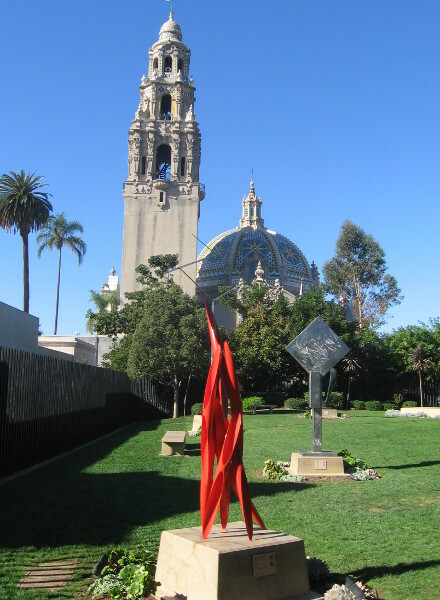 They’re hanging in the courtyard in front of the Museum of Man, at the west end of El Prado in Balboa Park. The first advertises an exhibition about the history of beer. Beerology seems to include the study of imbibing pharaohs and thirsty headhunters. Drink up! The second depicts a chair covered with sharp spikes. Presumably one of those can be found on display in the museum, along with other delightful instruments of torture. A quite memorable cultural experience! People walk through plaza in front of the Museum of Man. Posted on October 21, 2013 February 21, 2014 Tags advertisements, balboa park, beer, culture, funny, history, museum of man, museums, san diego, tortureLeave a comment on Beer, headhunters, and instruments of torture. Peek into the San Diego Firehouse Museum. 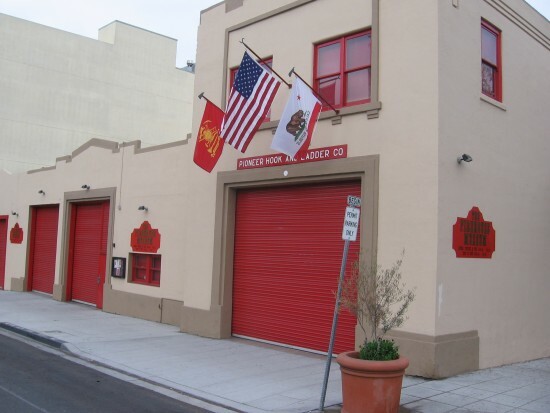 If you’re ever in the Little Italy neighborhood in downtown San Diego, you might want to check out the small but jam-packed Firehouse Museum. Shiny red fire trucks, interesting historical photos, old fire fighting apparatus, memorabilia and even Smokey Bear are on display. And excited kids can climb into one of the cool fire engines! This sign by the sidewalk invites tourists and passersby to take a peek into the firehouse. I took a photo from outside, aiming left. And then the above photo aiming right. The San Diego Firehouse Museum in the early morning. A plaque appeared on the museum’s exterior in mid to late 2015! Old Fire Station Number Six. 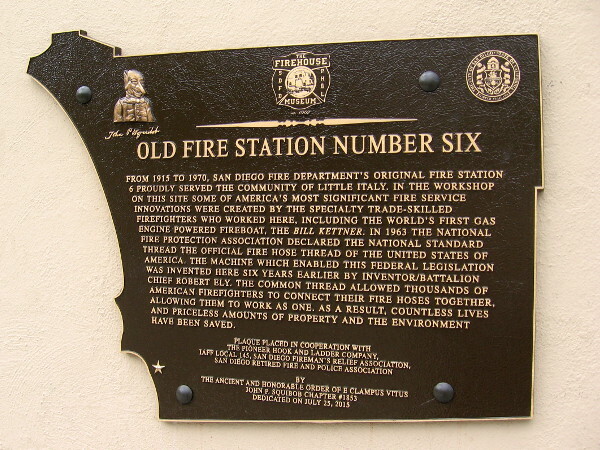 From 1915 to 1970, San Diego Fire Department’s original Fire Station 6 proudly served the community of Little Italy. In the workshop on this site some of America’s most significant fire service innovations were created by the specialty trade-skilled firefighters who worked here, including the world’s first gas engine powered fireboat, the Bill Kettner. In 1963 the National Fire Protection Association declared the national standard thread the official fire hose thread of the United States of America. The machine which enabled this federal legislation was invented here six years earlier by inventor and battalion chief Robert Ely. The common thread allowed thousands of American firefighters to connect their fire hoses together, allowing them to work as one. As a result, countless lives and priceless amounts of property and the environment have been saved. Posted on October 20, 2013 October 14, 2016 Tags cool, downtown, firefighters, firetrucks, history, inventions, little italy, museums, plaques, san diego, smokey bear, tourismLeave a comment on Peek into the San Diego Firehouse Museum.